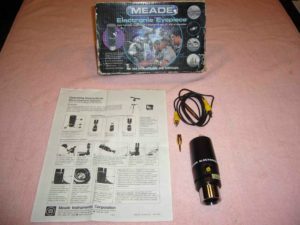 Meade Electronic Eyepiece #902. Fits in 1-1/4″ focuser. Connects to TV or monitor with NTSC video signal through RCA yellow plug. Powered by 9-volt battery. 320 x 240 pixels (76.8K). Equivalent to a 4mm eyepiece (very small FOV). Good for bright objects (moon, sun (with solar filter), planets and terrestrial objects). Stored by/Loaned to: Ed P. Available for check-out.